Updated for the 2017-2018 NFL season! This web application allows you to host a weekly pick'em football pool for your friends and acquaintances. It's suitable for dozens of players and offers several options for play (pick games straight up or against the spread, use confidence rankings, etc.) Players can even trash talk on the built-in message board. In addition, you can run a survivor pool, a margin pool or a combination of both. 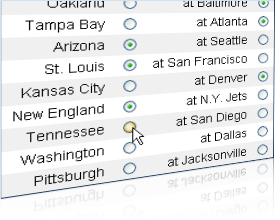 It also includes two different pools for the playoffs one for the Super Bowl. Just download the code, set the options you want and upload it to your site. Users can then sign themselves up (or you can add them yourself) and begin playing. Using a special administrator account, you manage players, set point spreads (if used) and update game results. For more information, see the full list of features. You can also see it in action with the online demos. Each demo showcases different pool options and you can check the individual help sections for more detailed rules. Nothing, it's free. Donations are appreciated, however. The Season Has Already Started, Can I Still Run a Pool? Yes, each weekly pick'em pools is independent of the others. While the survivor and/or margin pool normally runs the length of the regular season, it can be set to start on any specific week. If you don't already have a suitable web site, try one of these free hosting providers. The pool uses Microsoft's Active Server Pages (ASP) and a Microsoft Access database. If your web host supports those two things, you can run the pool. If you choose to use the optional email features, you will probably need to customize some of the code to make it work with your particular hosting service. The included set up instructions contain more details. You certainly can. All the pages are designed to be XHTML compliant and use CSS for styling so you can easily change the look. If you have some programming knowledge, you can modify the code to suit your tastes or add new features. Have a comment, suggestion or idea to improve the pool? Join the forums or contact me.